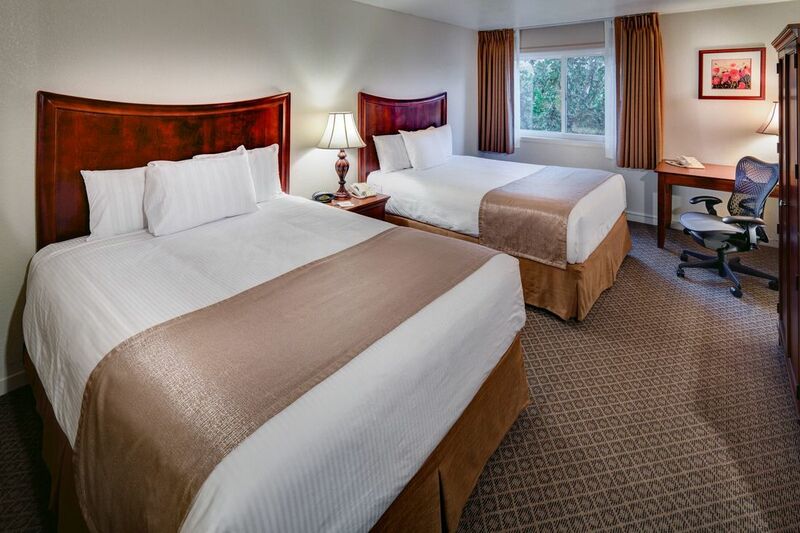 ​Settle in for an unforgettable stay at Lake Natoma Inn. We’ve taken care of every detail to ensure that you feel at home during your time with us. 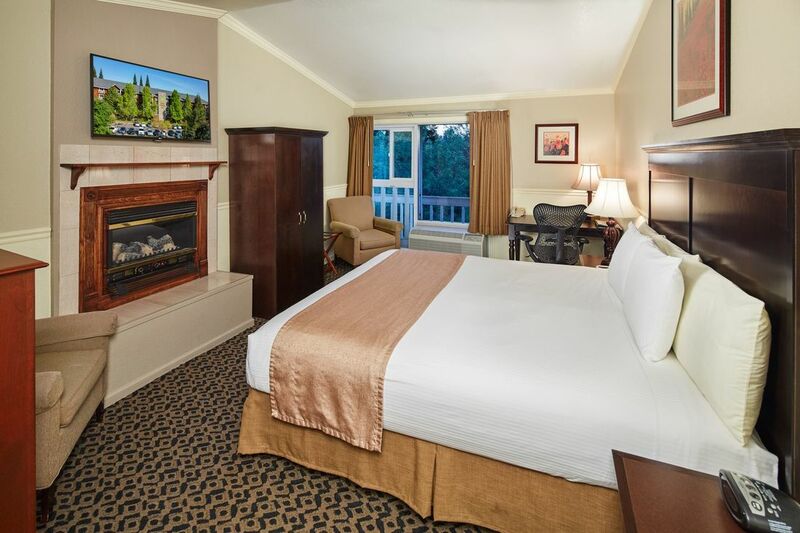 Our 136 rooms and suites are comfortably furnished and warmly decorated – inspired by the beauty of our location, perched on the American River in Old Town Folsom. Our Traditional King Rooms measure 300 square feet. They offer one California King bed, featuring Simmons World Class Felicity Pillow Top mattresses, a coffee pot, iron, and hair dryer. The Traditional Room also includes a flat screen TV, telephones with voicemail, a second data port, and in-room movies as well as in-room music and complimentary high-speed wireless Internet access. Our Traditional Double Queen Rooms measure 300 square feet. They offer two Queen beds, featuring Simmons World Class Felicity Pillow Top mattresses, a coffee pot, iron, and hair dryer. Our Executive King Rooms measure 300 square feet. They offer one California King bed, featuring a Simmons World Class Felicity Pillow Top mattress, and a sofa bed. 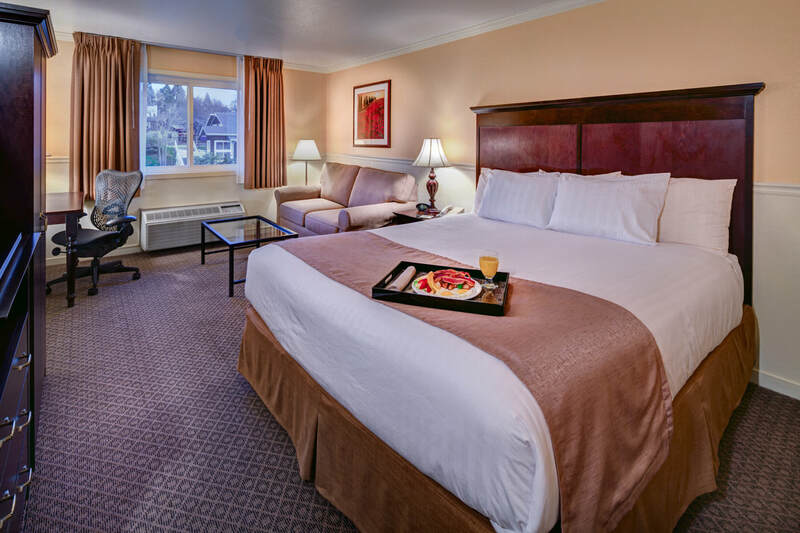 The Executive King Room features a coffee pot, iron, hair dryer, mini refrigerator, microwave, flat screen TV, telephones with voicemail, a second data port, AM/FM/MP3 clock radio, and in-room movies as well as in-room music and complimentary high-speed wireless Internet access. Finally, Executive King Rooms offer a work desk with ergonomic desk chair. 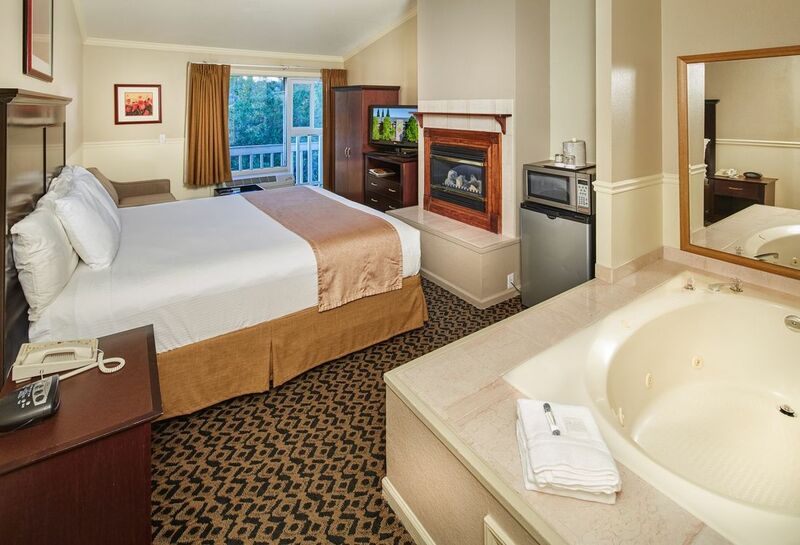 Our Deluxe King Rooms measure 300 square feet. They offer one California King bed, featuring a Simmons World Class Felicity Pillow Top mattress. The specialty in this room is an electric fireplace, located directly in front of the King bed. This room is guaranteed top floor, riverside. Further features include a coffee pot, iron, hair dryer, mini refrigerator, microwave, flat screen TV, telephones with voicemail, a second data port, AM/FM/MP3 clock radio, and in-room movies as well as in-room music and complimentary high-speed wireless Internet access. Finally, Deluxe King Rooms offer a work desk with ergonomic desk chair. Our Superior King Rooms measure 300 square feet. They offer one California King bed, featuring a Simmons World Class Felicity Pillow Top mattress. 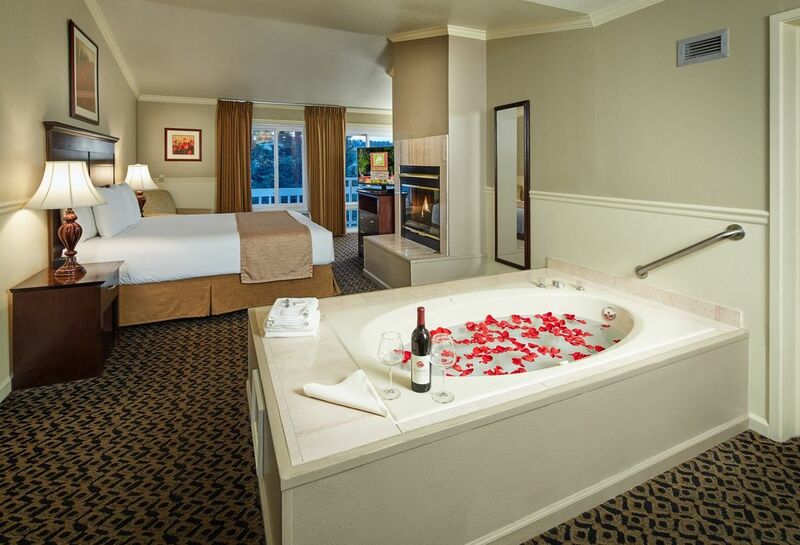 The specialty in this room is an electric fireplace, located directly in front of the King bed, as well as a whirlpool tub with jets. Further features include a coffee pot, iron, hair dryer, mini refrigerator, microwave, flat screen TV, telephones with voicemail, a second data port, AM/FM/MP3 clock radio, safe and in-room movies as well as in-room music and complimentary high-speed wireless Internet access. Finally, Superior King Rooms offer a work desk with ergonomic desk ​ chair. This room is guaranteed on the top floor, on the riverside of the hotel. Our Premium Suites measure 600 square feet. The sitting room contains a sofa bed, a double-sided wood-burning fireplace, and a refrigerator and microwave. The bedroom area features a California King bed, featuring a Simmons World Class Felicity Pillow Top mattress. The bedroom also contains a whirlpool tub and a small vanity table. The Premium Suite also includes two flat screen TVs, telephones with voicemail, a second data port, AM/FM/MP3 clock radio, in room movies, in room music, a work desk with an ergonomic desk chair and complimentary high speed wireless Internet access. This room is guaranteed on the top floor, on the riverside of the hotel.